The basic chicken-poaching technique is the foundation for thousands of preparations: Any dish that uses chicken stock or shredded chicken starts here. 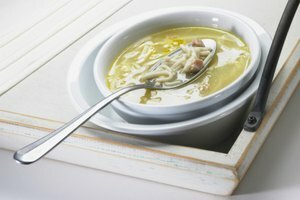 It also serves as the master recipe for all broth-based chicken soups -- chicken pho, chicken noodle and tomato-chicken soup, for example, all build off the same technique, as do numerous sauces and gravies -- you simply add the ingredients after the chicken cooks. 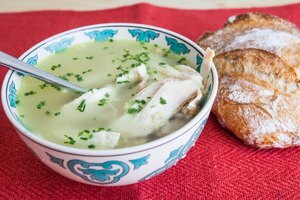 Most soup ingredients can't handle the 1 hour and 15 minutes it takes to boil a whole chicken, so add them to the broth in order of longest-cooking ingredient to quickest-cooking. Chop 1 pound of onions and 1/2 pound each of carrots and celery for each chicken used. 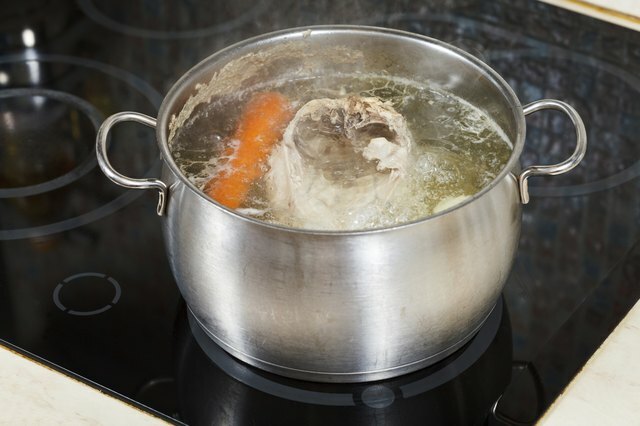 Place the chicken in a large stockpot and cover it with 1 or 2 inches of water or chicken stock. Bring the water to a rolling boil and skim the froth that collects on the surface for about 5 minutes. Lower the heat until the water simmers. Add the vegetables and basic broth aromatics: a couple bay leaves, parsley stems and peppercorns. Simmer the chicken until the flesh effortlessly slides off the bone with a fork -- a visible sign of doneness -- about 1 hour and 15 minutes. Take the stockpot off the stove. Grasp the chicken using a pair of tongs -- insert one tong all the way in the cavity and the other near the backbone for a solid grip. Lift the chicken above the water and let it drain for a few seconds and set it in a shallow dish. Strain the broth into a food container or dish. Set aside for soup or reserve for broth. Break the chicken down into parts -- thighs, wings, legs and breasts. Discard the skin and pick off the meat. Shred the chicken with your fingers or two forks in a mixing bowl after it cools enough. Discard the bones and fat. Simmer the whole chicken with 1 pound of chopped onions and 1/2 pound each of celery and carrots for 1 hour and 15 minutes. Season the water to taste with kosher salt before you add the chicken to it. Prep the soup ingredients you want to add while the chicken simmers, and set them aside. Keep starches, such as potatoes and parsnips, in water with a squeeze of lemon juice to prevent them from browning. Take the chicken from the broth using tongs and set it in a shallow dish. Strain the broth and return it to the stockpot. Pick the meat from the chicken and shred it. Add the soup vegetables to the stockpot and simmer them until cooked through. Return the chicken to the stockpot and add the finishing herbs -- chopped parsley, rosemary and thyme -- for example. Simmer the chicken for 5 minutes and serve. To freeze leftover poached whole chicken, separate the pieces you want to store: Cut through the thigh joint to separate the legs, and cut through the shoulder joint to separate and cut the carcass in half to cut out the breasts. 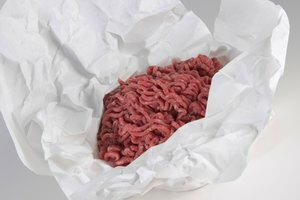 Pat the pieces as dry as you can and pack them in a heavy-duty freezer bag. Store in the freezer up to 1 year. Chicken should measure 165 degrees Fahrenheit in the thigh and breast when ready.